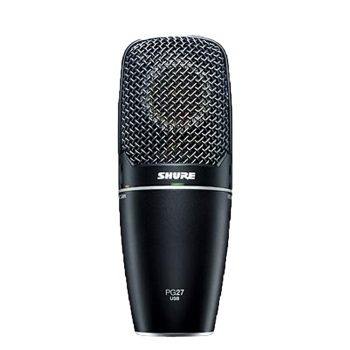 The PG27USB side-address condenser microphone easily plugs into a computer USB port for the convenience of digital recording. Designed with a flat frequency response, the PG27USB naturally reproduces a wide variety of acoustic, amplified and vocal sound sources - with professional clarity and guaranteed "Plug and Play" Shure quality. The PG27USB microphone includes a 9.8ft (3m) USB Cable, Stand Adapter and a Zippered Pouch. USB Plug and Play connectivity allows the convenience of digital recording, anywhere your computer can go. Compatible with Windows 7, Vista, XP, 2000 and Mac OS X (10.1 or later). Integrated pre-amp with Microphone Gain Control allows control of input signal strength. Zero Latency Monitoring for real-time playback and multi-tracking without disorientation. 1/8" Headphone jack for monitoring. Monitor Mix Control for blending microphone and playback audio.